Circe Slab is a slab version of the popular geometric sans serif Circe. It contains variations in weight and contrast, including three regular styles that range from non-contrasting geometric to almost typical book serif contrast ones. In addition, all text styles have narrowed versions. The character set of the font includes small caps, minuscule figures and a wide variety of alternative capitals and small caps. 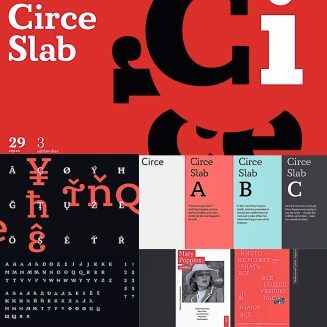 Regular styles of Circe Slab are suitable for long texts and the light and bold ones for headlines. Cyrillic included. Tags: cyrillic, cyrillic font family, font family, old style, slab serif.